Over a medium heat, gently cook the onion in 1 of the coconut oil until it’s translucent. Add the garlic and cook for a minute. Next add to this the cumin and turmeric, cooking a further minute before adding the quinoa and vegetable stock. Bring to the boil and simmer for 15 minutes. Heat the other tablespoon of coconut oil over a medium heat in a frypan and add the sweet potato. Turn it frequently until it’s lightly browned and cooked through. 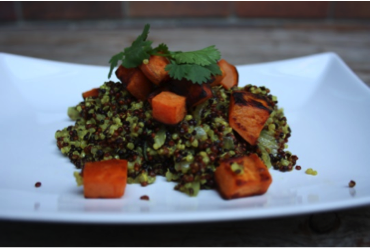 Lastly, place a few heaped spoonfuls of the quinoa onto individual plates, with a sprinkling of crispy sweet potato cubes on top. Garnish with fresh coriander and a light sprinkle of Himalayan salt.